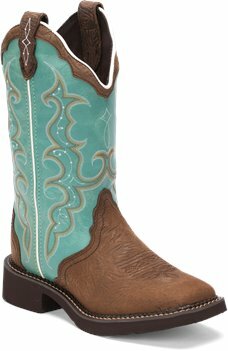 Take some chances in the 12-inch tall Raya Turquoise Justin Gypsy™ Women's cowboy boot. 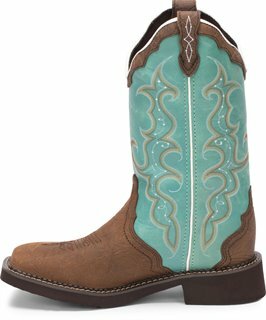 Its teal leather upper is accented by a delicate white and gold stitch pattern and features a scalloped collar for a feminine touch. The distressed golden brown vamp gives this boot a vintage feel and sports a square toe. The J-Flex Flexible Comfort System® insole with removable orthotic inserts guarantees lasting comfort for the free spirit ready to run wild.